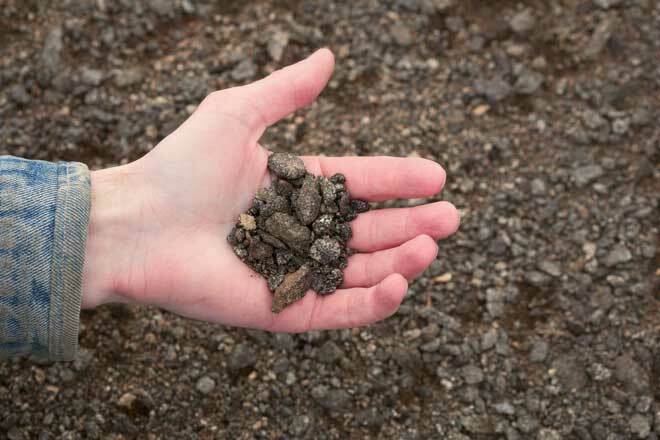 Rocky soil can create a multitude of problems for your yard. Not only can they damage equipment, but rocks can also make it difficult for deep-rooted plants to grow and can also interfere with building a new addition. Clearing your yard of these objects can be tedious when done by hand, and it isn’t always easy to find an alternative. The following methods will greatly reduce the amount of time and effort needed to clear out your lawn, whether you need to dig deep or just clean up the surface. Whether you are planting a new lawn or preparing a garden, a multitude of rocks can become a major problem. Thankfully, removing surface rocks is much easier than having to go deep. The following methods should help prepare your yard for most basic landscaping needs. Although grass can grow over rocky soil, the risk of damaging your lawnmower or other equipment make it necessary to remove the rocks. Planting a garden requires even more stone removal. You can do this with only a rototiller and garden rake. Using a rototiller, slowly loosen the soil. This will break up the dirt and expose large rocks. Place these rocks into a wheelbarrow as they are uncovered. 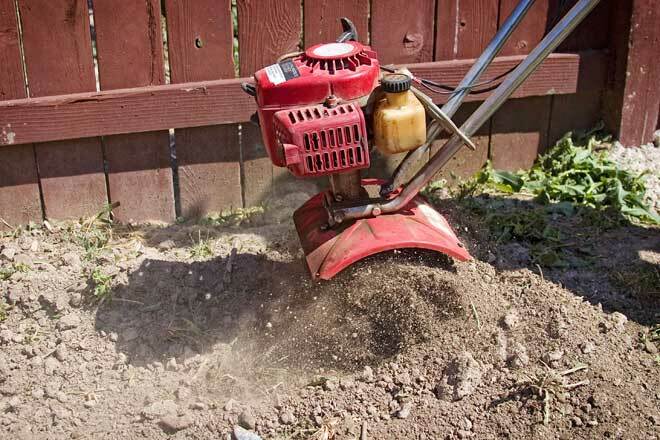 Once you have finished rototilling the area, use a garden rake to pull any stones from the soil and into a pile. You can then place the stones into the wheelbarrow or save them for lining paths or garden beds. You will need to measure your wheelbarrow to find the dimensions before beginning. Cut two of the two-by-fours to the length of your wheelbarrow or the width of your hardware cloth, if the latter is shorter. The other two should be cut three inches shorter than the width of your wheelbarrow. In the event your wheelbarrow tapers, you will want to use the larger width. Create a box frame by driving nails or screws through the ends of the side boards into the tips of the shorter boards. Starting in one corner, staple down one side of the hardware cloth to the underside of the frame. You can drive in a screw or small nail on the opposite corner to pull the cloth tight. This will help keep the cloth taught as you staple that corner down. Nail the 1.5 inch lumber to the underside to further secure the hardware cloth and help prevent breakage. Finally, nail the one-by-four boards along the sides, allowing them to overhang on the bottom to hold the sieve in place. In the event your wheelbarrow is longer than the frame, you may cut the board from that side into two smaller pieces to fit more securely on the front of the wheelbarrow. You may then place the sieve on the wheelbarrow and shovel dirt onto it, allowing the hardware cloth to catch any larger stones while the soil and smaller aerating pebbles are deposited into the wheelbarrow. In the event you are removing an old gravel path or large amounts of debris, you can finish up with a leaf rake to separate small pebbles from the soil. As these pebbles normally help with drainage, they should be left in a new garden or landscaped area under normal circumstances. Note that removing all pebbles from an area will allow the soil to pack down and may create flooding risks over time. Removing boulders can be a lot more difficult than simply loosening and raking the soil. You will need several pieces of equipment and some elbow grease to complete the task. Once you have everything you need, take a deep breath and dig in – literally. Using a pointed shovel, excavate around the boulder until it is completely uncovered. Place it into the wheelbarrow, if you are able. For larger boulders, you will need to drill holes using the hammer drill and insert the feathers and wedges. You can then drive the latter in using a mallet to split the boulders into smaller stones. Begin by sticking a pry bar under the boulder and wedging a piece of six-by-six lumber under the bar to create a fulcrum. Pull the bar back against the lumber to dislodge the boulder. 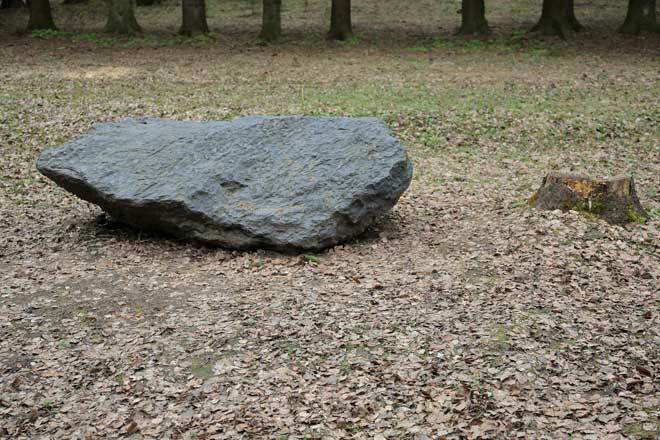 You will have to repeat these two steps several times to shift the boulder across your yard. Lay a piece of two-by-six lumber on top of several sturdy iron pipes beside the boulder. Using the previous method, shift the boulder onto this platform. You may now slowly move the platform out of the yard, although you will have to pause frequently as the platform clears a pipe so that you may put the pipe in front of your makeshift sled. When the opportunity arises, it is best to get a truck or tractor involved. Shift the boulder as mentioned in step 1 until you are able to wrap a chain or some four-inch nylon straps around it. Attach the other end of your chain or nylon to the tow hitch of your vehicle and use its horsepower to tow the boulder out of the way.